For Slumber Party Games that include some competition, stay here on this page. If you are looking for pajama party activities that have no winner or loser, we offer those as well. You will find the non-competitive activity ideas at Slumber Party Activities. I was lucky as a child. My parents had no problem with sleepovers being at my house. My girlfriends would all show up with pillows, sleeping bags and pajamas. 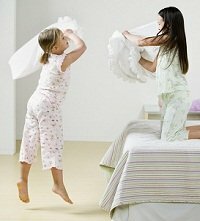 It didn't take much more than a pillow fight to have a lot of fun. As a teenager, the types of party games we played got a little more sophisticated. Out came the make-up, nail polish and a good old fashioned game of Truth or Dare. And just because I am all grown up, doesn't mean I don't play games. To begin with, I am the baby of six girls. So right there, our yearly sisters reunion could be called one big sleepover. Then of course, I have organized slumber parties for different groups of girlfriends. I have hosted and planned slumber parties at a beach house, bed and breakfast, a hotel and even a campground. There is no need to stay home for a slumber party, unless you want to! And at each of these events, there were of course, slumber party activities and games. As an adult, I like to play the classic games I played as a kid. My girlfriends are totally game when it comes to playing silly girl games. So don't be afraid of breaking out the pillow fight followed by a round of Spin the Nail Polish Bottle!